I promise; the lemonade recipe is on the way. On Saturday, I gave you a Sneak Peek at a giant hand squeezing a lemon, and I still owe you the accompanying recipe and the rest of the photos to go along with it. 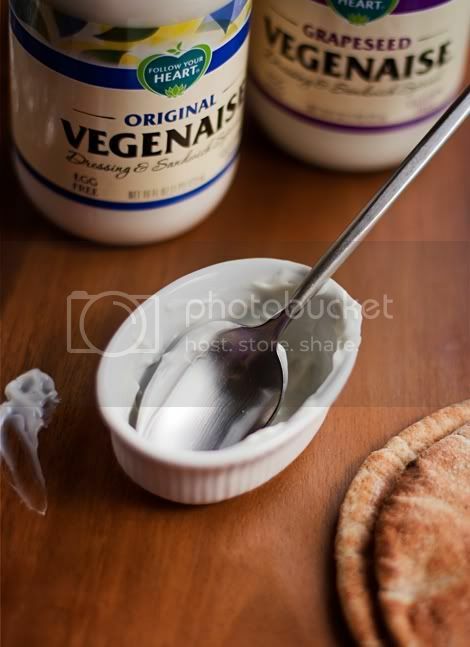 But for now, at the risk of looking like a big Vegenaise ad, I wanted to give everyone who is new to the Pure Vegetarian (vegan) thing a little background on my favorite mayonnaise-replacer. Mayo, by definition must include eggs in the ingredients, and since eggs are not pure vegetarian, mayo is off limits to those choosing to abstain from eating animal products. Seasoned pure veggies already know all about Vegenaise, an ingredient I list in my recipes often; however, those who aren't so seasoned may not be as in-the-know. First; I say it to everyone else, so I'll say it here, too: I love Vegenaise, and as far as I'm concerned, it tastes better than real mayo. Made for 40 years by a company called Follow Your Heart, Vegenaise is a dairy-free, eggless mayonnaise alternative. You can find Vegenaise in most natural markets in the U.S., and increasingly in many supermarkets in the health food aisle. Vegenaise can also be ordered directly from Follow Your Heart, and if you're in southern California, you can stop by their eponymous market & cafe to purchase Vegenaise and/or order a dish prepared with it. Simply put, use Vegenaise like you would use mayonnaise. I love my Vegenaise spread thick on kaiser rolls and topped with piles of fresh lettuce, tomatoes and other vegetarian deli items; or as the base for awesome homemade aioli. For a list of answers to all of the most frequently asked questions about Vegenaise, and to order some of your own, visit Follow Your Heart's website.